Oleksandr Usyk labelled Tony Bellew as the best opponent of his career when they met at an intense press conference on Thursday. 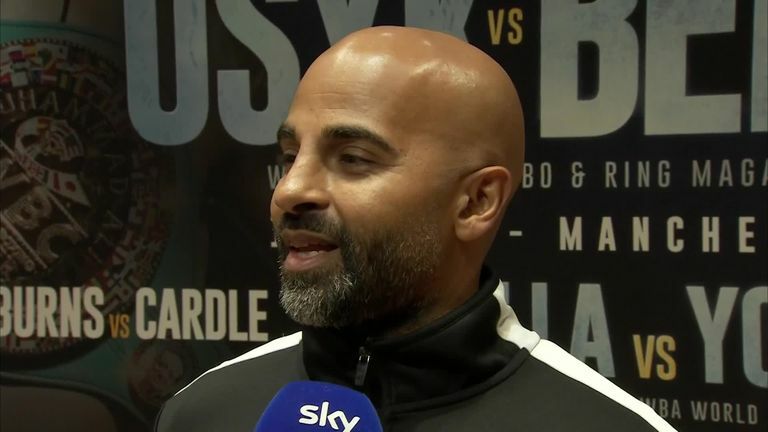 A determined Bellew was masked by a bandana and claimed he would take advantage of his "puncher's chance" in Saturday's undisputed world cruiserweight championship fight. A knowing smile stayed on Usyk's face, and he pulled a hood over his head, before exchanging quiet words with Bellew during their face-off. Usyk, holder of all four major divisional belts plus an Olympic gold medal, had earlier been asked if Bellew is the toughest test he has encountered, and said: "Definitely yes. Tony is my best opponent ever. "He is really dangerous. He is the same height, same weight. Look at his eyes - they are angry." 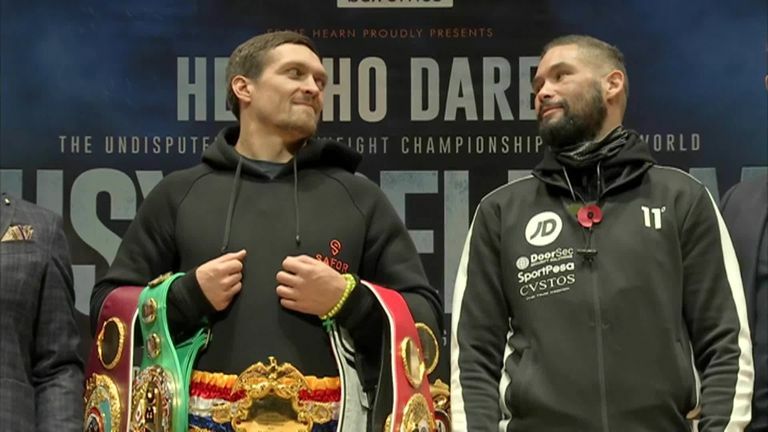 Usyk and his promoter Alexander Krassyuk of K2 Promotions could not hide their laughter when trainer Dave Coldwell promised that his man, Bellew, hits hard enough to "knock out anybody". Ukraine's Usyk has collected the IBF, WBA, WBC and WBO gold in just 15 pro fights, venturing into the home countries of Krzysztof Głowacki, Michael Hunter, Marco Huck, Mairis Briedis and Murat Gassiev and emerging victorious every time. Bellew admitted the difficulty of the task ahead but vowed: "I meet a man with exceptional talent. He has everything I have except one thing - I can switch someone's lights out in one second. "I learned that at school, and I can still do it now. I switch people's lights off in the blink of an eye." 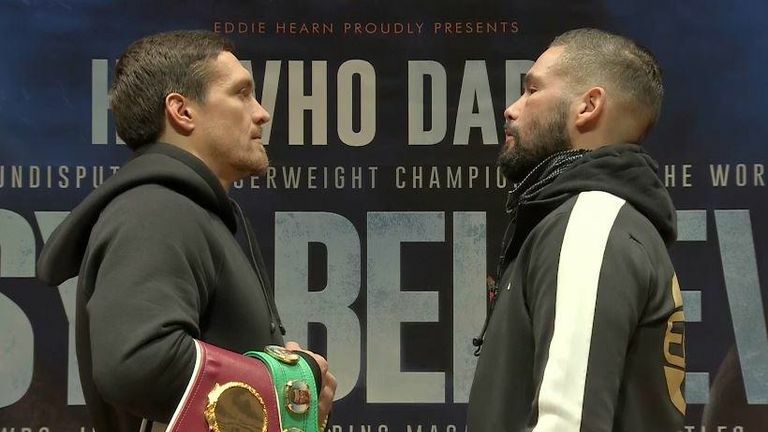 Bellew won the WBC cruiserweight title two years ago with a vicious barrage of punches against Ilunga Makabu and retained it against BJ Flores in similar circumstances before two heavyweight wins over David Haye. "I am about to take the biggest step that any British fighter has ever taken," Bellew said. "I can lose this fight, he is very good, but I don't think I will. I will beat him, stop him and break his heart. "Time to let a monster catch a monster!" Bellew reflected on his two defeats, to Adonis Stevenson in Quebec for the world light-heavyweight title, then to former rival Nathan Cleverly. "Nobody cared when I was sat on the floor in Canada as a failed light-heavyweight," Bellew said. "Nobody cared after the Cleverly rematch which was terrible. Look where I am now. That's what belief can get you. "We all fail in life. I have failed on a greater scale. But I have also reached greater heights. To reach great goals you have to take great risks. "If he's as good as everyone says, I may lose. But what would have haunted me more is if I stayed retired - when he called, I walked away. That would have haunted me."